From the U.S. perspective, the anti-Soviet war in Afghanistan began in 1978, when a coup d'état brought a communist regime to power in Kabul. Over the next year, armed resistance grew, a trend which triggered approaches to the CIA by Pakistan and Saudi Arabia. 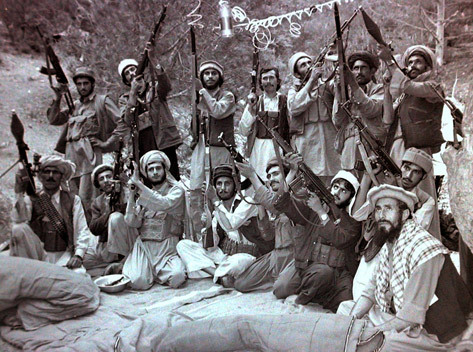 Plans began to be drawn up for reversing “the current Soviet trend and presence in Afghanistan,” and in the summer of 1979, Carter approved covert aid to mujahedin guerrillas. Although this aid did not include arms, it provided nonmilitary supplies and cash with which weapons could be purchased. Six months later, the Soviets sent troops into Afghanistan, a move which immediately led Carter's National Security Adviser to advocate “more money as well as arms shipments to the rebels,” both directly and via Pakistan, China, and Islamic countries. For the next decade, the CIA aided the guerrillas, at first with weapons purchased from China, Egypt, and Pakistan, then with increasingly sophisticated U.S. arms (including Stinger missiles, shipped to the mujahedin at the same time as to UNITA). All told, U.S. aid in arms and cash totaled some $2 billion. Up through the late 1980s, American assistance was supplied through the Pakistani intelligence service (ISI), which also provided training; except on rare occasions, the CIA did not deal directly with the rebels. In addition, Saudi Arabia contributed significant sums of money to the resistance until, by the end of the 1980s, its financial role was greater than that of the U.S.
1) Newsom, statement in meeting of 30 March 1979, paraphrased in Gates (1996: 144); Brzezinski to Carter, “Reflections on Soviet Intervention in Afghanistan,” 26 December 1979 (CNN 1998: ep. 20); McWilliams to State, “ISI, Gulbuddin and Afghan Self-Determination,” mid-October 1988, quoted in Coll (2004: 183); also “Afghans: Now They Blame America,” New York Times Magazine , 4 February 1990; Cogan (1993); Rubin (1995a, 1995b); Cordovez and Harrison (1995); Scott (1996: ch. 3); McCoy (2003: ch. 9); Crile (2003). Note that the initial contacts between the mujahedin and the CIA date to 1978 (Schroen 2005: 43-4); note also that there is considerable controversy about whether, and if so how much, the Stinger missiles contributed to the Soviet decision to withdraw.